MSNBC host Dylan Ratigan on Monday eagerly attempted to convict Sean Hannity for the supposed misuse of funds by a pro-troop organization he supports, a claim already investigated and debunked. The anchor highlighted complaints against the Freedom Alliance group by the George Soros-backed Center for Responsibility and Ethics in Washington (CREW), but never identified their liberal tilt. Ratigan promoted CREW's assertions that the Freedom Concerts, which the Fox News host promotes, aren't giving all the money they take in to scholarships for the families of fallen soldiers. He sneered, "Hey, what the heck? You come up with a good cause. Give ten or 15 percent away and keep the rest for yourself. What do I know?" Not much, apparently. 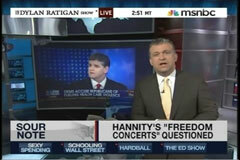 The MSNBC anchor made almost no effort to offer Hannity's side of the story or that of the Freedom Alliance. David Frum's website analyzed this controversy and found the charges to be bogus. But, Ratigan wasn't interested in this. Instead, he mocked, "Who knows what happens to the rest of [the money]? But, not going to the kids, apparently." There is absolutely no merit to the scurrilous charges launched against Freedom Alliance from two of the most left-wing organizations in the country," Kilgannon said in a statement. "The smear-mongers who have launched this politically motivated witch hunt against Freedom Alliance will be proven wrong as we aggressively defend ourselves in the days and weeks ahead." For more on this subject, see MRC President Brent Bozell's statement. DYLAN RATIGAN: Up next, a series of charity concerts organized by Fox News' Sean Hannity hitting a little bit of a sour note. The shows are billed as helping the innocent victims of war, an admirable cause. The children of troops. Here's Mr. Hannity himself explaining the charity's mission. SEAN HANNITY: These guys have kids. The purpose is all of the money that we make we put in a scholarship fund for the children of these slain heroes. RATIGAN: A noble case, no doubt. But, it's simply not the case, according to the watchdog group Citizens for Responsibility and Ethics in Washington. They have now filed- that's a funny title for that town. Anyway, they filed complaints with both the Federal Trade commission and the IRS claiming we will never know if every penny goes to the kids. The complaint alleges, quote, "illegal and deceptive marketing practices by suggesting that all money generated by ticket sales for the freedom concerts that Hannity sponsors each summer goes to scholarships for children of killed and wounded service members." In fact, according to an '08 tax filing by the Freedom Alliance, which runs this charity mission for Hannity, the group actually only gave 12 percent of its revenue to the children of fallen soldiers, while spending more than $150 grand on travel expenses. The list goes on. The Freedom Alliance says their financial records not only meet but exceed charity standards. Hey, what the heck? You come up with a good cause. Give ten or 15 percent away and keep the rest for yourself. What do I know? Who knows what happens to the rest of it? But, not going to the kids apparently. -Scott Whitlock is a news analyst for the Media Research Center. Click here to follow him on Twitter.